Several England players are due to visit the 3aaa County Ground to face Derbyshire in the early part of the new cricket season. And they include the Nottinghamshire trio Alex Hales, Stuart Broad and Jake Ball. The ECB have announced that most of England’s centrally contracted players will be available to play for their counties during the first months of the domestic campaign. 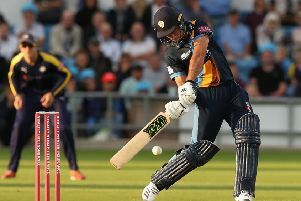 Derbyshire Falcons face Notts Outlaws in Royal London One-Day Cup action on Tuesday, May 2, and fast bowlers Broad and Ball, plus hard-hitting batsman Hales, are all available for the fixture. The 30-year-old Broad has played 121 one-day internationals (ODIs) for England and taken 178 wickets, while Hales has hit five centuries in his 41 matches. Ball broke into the national side in 2016 and has since played three Tests and six ODIs, with best bowling figures of 5-51 against Bangladesh. Ben Duckett is also likely to face Derbyshire when they play Northamptonshire in both the Specsavers County Championship opener, starting on Sunday, April 14, and the Royal London One-Day Cup fixture later in the month. Similar to Ball, Duckett burst on to the international scene last year and has a reputation for destructive top-order batting.